Happy Sunday to you. Today is another edition of #SundaySupper. This weeks mission is to come up with a recipe that uses berries. Your probably thinking, that’s all this girls posts is berry recipes! I can’t help it, I love berries! But you won’t believe this, I was stumped on what to make. You know it’s kind of pressure to come up with a recipe, especially when all these ideas coming rushing through your head, but you can’t manage to catch one. Well, I actually did come up with a recipe and it wasn’t this one. See I had this grand idea of making a light and flaky berry strudel made with phyllo dough. I made my wonderful thick, sweet berry mixture, had all my ingredients out and was ready to go. I opened my package of phyllo dough and the sheets were stuck on each other. I pulled one sheet off, it ripped. I pulled another and it ripped. I grabbed four pieces, they tore. Ahhhhhh!!! I was so irritated, that I crumbled up the phyllo dough and threw it out. I threw out the whole package! I shouldn’t have done that, but I was just so irritated! I looked at my berry mixture and thought what can I make with it now? Ugh!!! I starred at my berry mixture, and took a bite! Then two and I said wait, don’t eat your anger!! I decided to play with the dogs in the back yard, as I pondered what to do with my berries. What can I make? Ohhh, the agony! I thought, cheesecake parfaits? Then I thought to many calories. I could use instant pudding, but thought nah! At this point my berries were pretty cool. Then I thought I’ll make a bread type dish and roll the berries up in that. No! I was getting lazy and even more upset, that I didn’t have the patience to make a huge dessert now. Then it came to me, how about a Stove Top Berry Crumble? I set my berries to the lowest setting on my burner, just so they would warm up. I pulled out my rolled oats, and ground them up into flour, since my Husband doesn’t like chunks of oatmeal and then I added some ground cinnamon, pulse some more. Pulled out my skillet and toasted my oats. I think this is going to work? Once my oats were toasted, I added two tablespoons of butter and a packet of stevia, cooked it until all the oats were coated and put it over my berries. Bingo, it worked!! I couldn’t believe I did it! I came up with a healthy, good for you dessert that is low in calories and tastes great!! I was so proud of myself that I grabbed my skillet and ran to the garage to show my Husband. He didn’t care! But I did and I was so happy!!! This was such a great idea!! 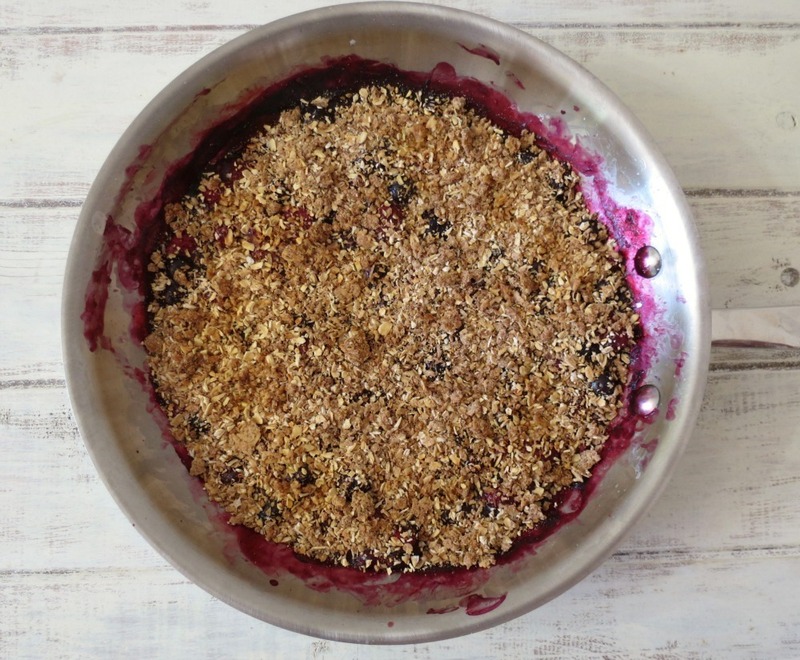 I actually love this idea of making a crumble on the stove top rather than baking it! Without my mistake, and hour of wondering what to do, it actually comes together in about 15 minutes! You can’t beat that for a crumble!! For the fruit I used some fresh organic strawberries that I picked up from the Farmers Market and some organic blueberries from Trader Joe’s. I don’t know about you but the blueberries at the Farmers Market are really expensive, I’ll stick to Trader Joe’s, thank you very much! 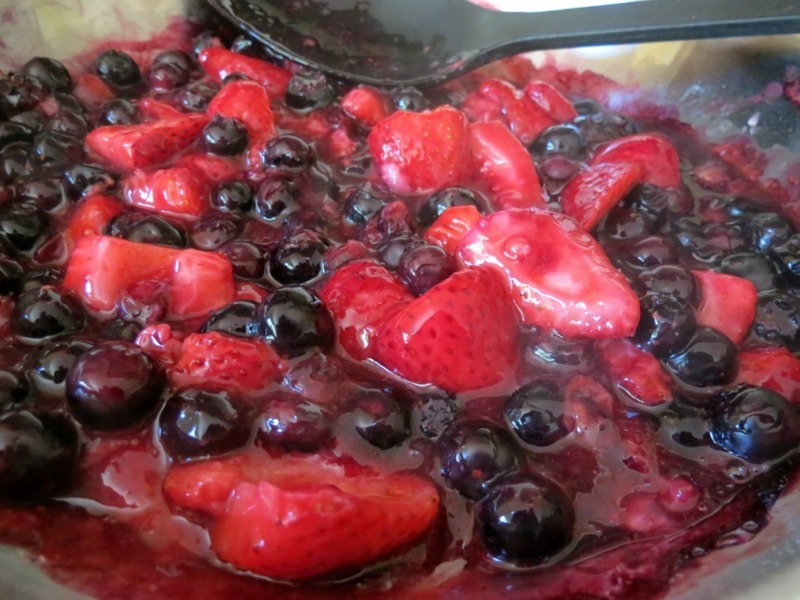 I cooked the berries in a 10″ skillet with some water, stevia and cornstarch. The key with cooking the berries is to keep stirring them, or they will burn! I also make my quick jams the same way! I love it this way! The flavor of this crumble is wonderful. Processing the oats and the cinnamon together worked out perfect. In every bite you get that nice hint of cinnamon and sweetness of the berries and the stevia. I like how natural this crumble is and it’s guilt-free too!!! I have been having it on my frozen yogurt and my morning greek yogurt. It’s perfect! I don’t need to add anything else to it. Oh, and its sooooo good by it’s self. I happened to always have my handy dandy spoon with me, when I walk by the refrigerator. I don’t know how I manage that? I do have to tell you when I ground the oats in the mini food processor, I used one cup of oats and 1/2 a tsp. of cinnamon. When I went to sprinkle it on my crumble it was too much, so I only used half. I only used 4 cups of fruit, if your planning on making this and you want to serve more people rather than four, I recommend upping the fruit mixture. Same process, just add more fruit, then top with a cup of crumble. But in this dish, if used all the oats it would have been to much and I wanted the fruit to really shine through. So in this recipe, I halved the topping. Warmed strawberries and blueberries topped with a toasted oat flour. Place a skillet over low to medium heat and add berries, cornstarch, water and stevia. Mix constantly until thick and bubbly (about 7 minutes). For more juice, smush down some of the fruit. Once thicken and fruit is softened, set heat to the lowest setting, occasionally stirring. Meanwhile, in a mini food processor add oats and cinnamon, process until flour like consistency. In a separate skillet add oat mixture and heat over low to medium heat, stirring occasionally until lightly toasted. Once you smell the oats, add butter and stevia. Mix until combined. Add oat mixture over top of berry mixture. NOTE: If the crumble topping seems to dry, add one more tablespoon of butter. Serve warm with ice cream or a dollop of whip cream. NOTE: When I made this, I originally made one cup of oats with ½ tsp, cinnamon and 2 tbsp. butter. 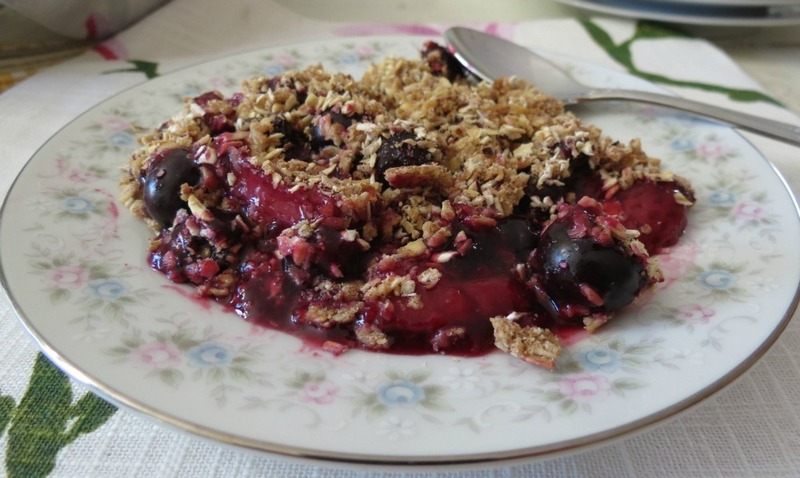 But when sprinkling the crumble topping over the berries, I only used half the mixture. 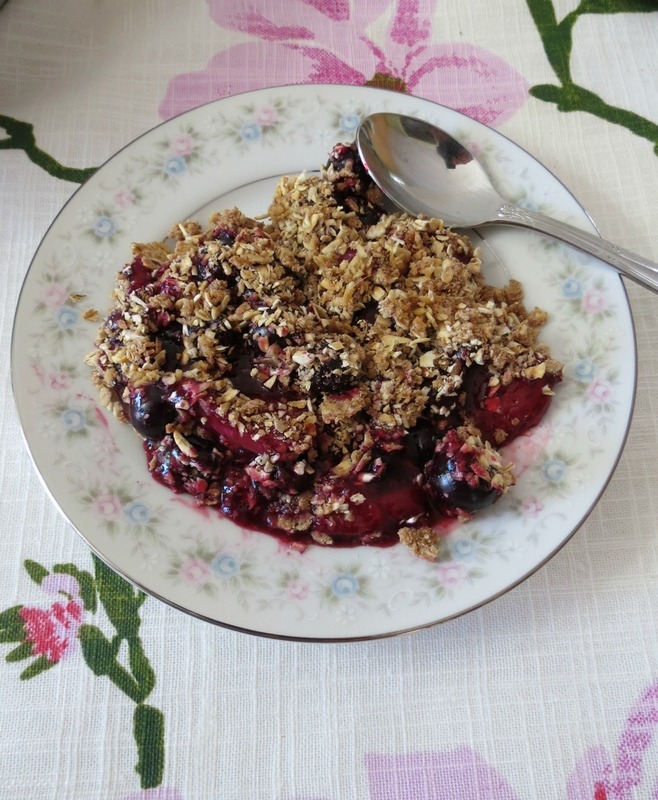 If you feel you need more crumble topping, just double the crumble topping ingredients. I guess sometimes it pays to make errors when cooking. I am so happy to discover a stove top crumble. I think this is the way I am going to make my crumbles from here on out. It’s easy, quick and tastes just as if you baked it in the oven. I just love it! Now I can have crumble anytime I want and not worry about heating up the house by turning on the oven! I can’t wait to see what berry creations the others came up with. I love my berries and I am in need of new ideas! Be sure to check everyone else’s recipes out! You call it dessert, I call it breakfast! 🙂 This looks great. Congrats on coming up with a healthy and easy dessert. I’ll have to try processing my oats as my hubby doesn’t like oatmeal in his desserts :/ Looks like a fantastic berry recipe, Jen…I’m ready to dive right in! Love easy things like this. Great dessert idea! So awesome that you turned a problem into a successful recipe! That must have been the best feeling in the world! I love when I have a success, especially from a flop. I have been having quite a few flops lately! Ugh! I love crumbles, but I HATE heating up the oven in the summer time. This was the perfect idea ever!!!! I have over a pound of cherries, but no berries. 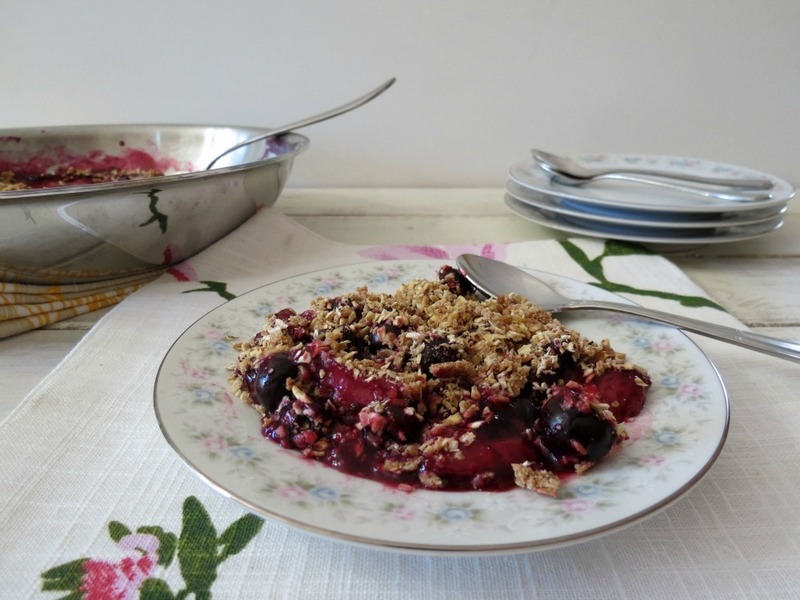 I’ll be making this tonight for dessert, but it’ll just be a cherry crumble. And tomorrow (since I have SO MANY cherries) I’ll be making your pan seared chicken and cherry salsa for dinner. Keep the cherry and berry recipes coming!!!!!! You rock! I love that this is all done on the stove top! 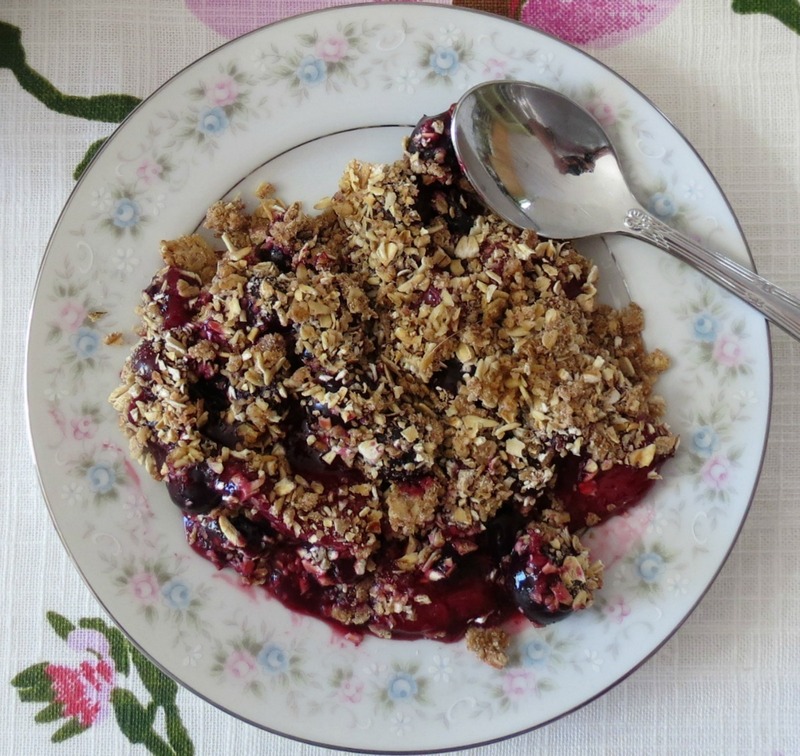 Crumbles are one of my favorite summer desserts. I love crumbles too! Any season, any fruit, it’s all good! LOL… love the part about running to the garage and your husband’s response. I think we’ve all been there, and done that… but sooo excited you found a way to make it work, and I agree, it sounds even better and is more healthy in the end. Well done!!! Love the is really easy to make. 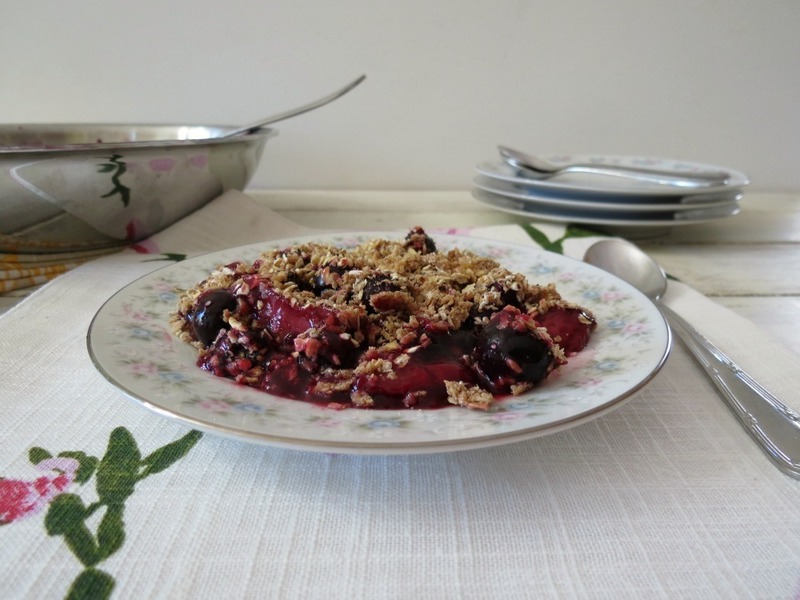 Isn´t this a fantastic berry crumble recipe?! No oven and toasted oats, so awesome Jennifer! And the fact that your husband didn´t care just goes to show why we become so interested in other food bloggers friendships, they are the only ones who understand! I am so happy I am not alone in the blogging world! Sometimes our men just don’t get it, maybe if it were a steak dish or something? Looks like you turned an unfortunate kitchen problem into a delicious dessert! Wow, what a great idea! Seems easy to make and quick and healthier- my faves! It is quicker which I like! Then just scoop and serve!! 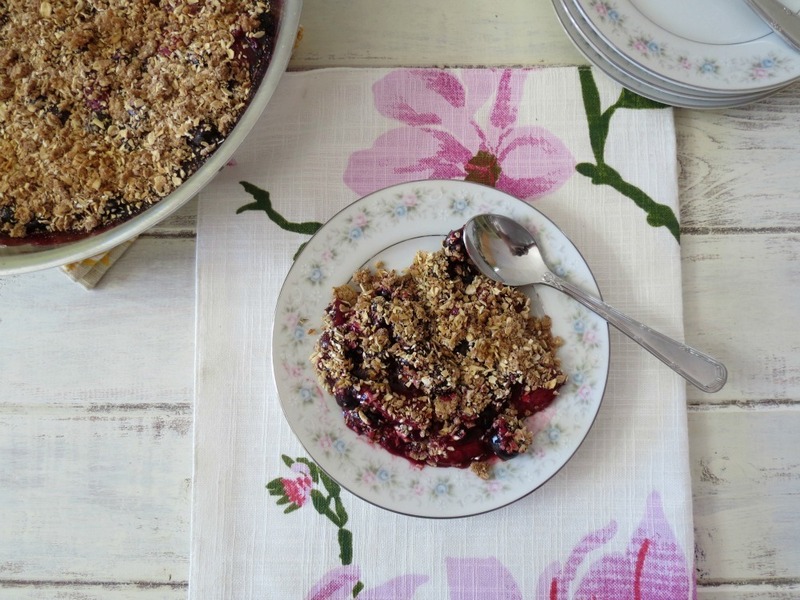 Your stove top berry crumble does look and sound scrumptious. I just got done making it and had my first bite and I have to say that this is extremely good! It’s just as good as making it in the oven and it feels like there’s even less work involved. I topped mine with a little bit of vanilla bean ice cream and once the ice cream starts to melt into the crumble, it gets even better! And the best part is that it’s only 3 points plus per serving!!! Yah! I am glad it turned out and you like it! The ice cream melting over it sounds so good! I have been craving ice cream!! Yum! Thank you for letting me know how the recipe came out. Phyllo dough is a tricky beast! The best thing to do is drape it with a damp towel that has been wringed out really well…and then ever-so-carefully peel one sheet off at a time. I’ve had to make thousands (no exaggeration) of little phyllo treats at a time for work and different catering jobs…I’m quite familiar with it ;). That said, crumbles are one of my favorite desserts, so I would devour this – and probably even choose it OVER a phyllo dessert! Looks awesome. I have made a crisp many times but never on top of the stove, this is a great recipe!! So I’m not the only one who goes outside and plays with the dogs when I need a break and to get my mind refreshed. I think being out in nature and having fun brings up such wonderful inspiration like this lovely stove top crumble. 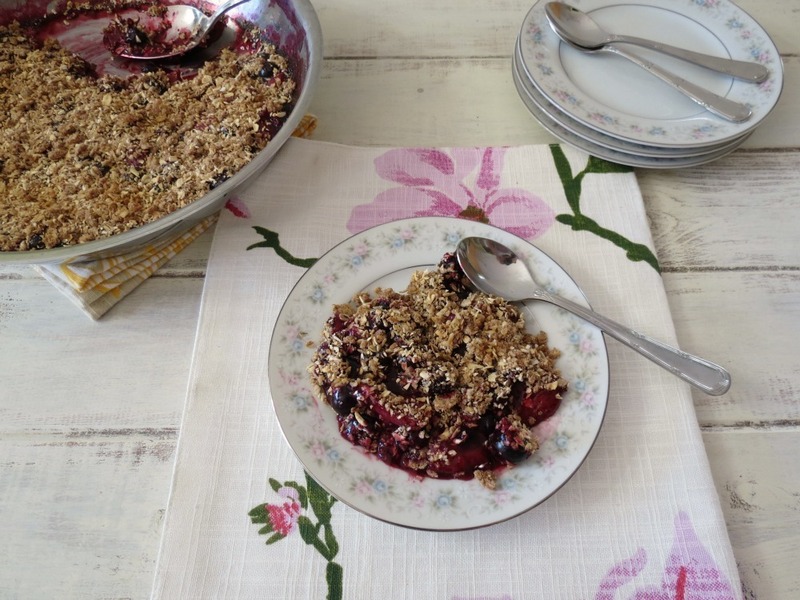 What a neat way to make a crumble! Too bad about the phyllo but hey…this was the result so its all good! Nice recipe, Jennifer! Oh wow, you really made a great tasting dessert after the disaster and I have to commend you on this!It looks lovely,has a gorgeous color and must taste great with the oats and cinnamon in there 🙂 Yum! This looks so good. Add a scoop of vanilla ice cream and I would be in heaven. It turned out great! What an awesome way to make the most of an unfortunate situation. This sounds and looks great! Pass me a big bowl please! Phyllo dough and I are not friends and we never will be. I don’t have the patience. You ended up making a delicious dessert! Thanks Megan! they make the dough look so easy, but it’s not! It always tears on me! A healthy dessert, I am in. Haha, I can totally understand throwing away the whole package of phyllo dough. Actually, my ONLY kitchen breakdown to date involved sticky phyllo dough, a warm day, and my first attempt at baklava. I ended up crying (which I NEVER do in the kitchen), and just dumping it ALL in the trash. Yeah, $20 worth of nuts for the filling, totally wasted. But I couldn’t help it. hahaha. Glad you understand! Phyllo dough looks so easy to use, but it’s not! Ugh! Sorry about he loss of nuts and filling! That is stinky! Yeah, but if homemade baklava is my only huge kitchen disaster to date, I’ll call it a victory overall 🙂 I’ll just leave that one to the pros. haha. An easy, quick dessert or I’d eat some for breakfast. Oatmeal and berries go so well together! Stove top sounds perfect for me . Love this easy recipe. Will be trying it soon ! This has become a weekly fav. I love this and it’s so easy! Blueberries have gotten really expensive in my area so sometimes I’ll do a strawberry, blueberry, raspberry mix since raspberries are so much cheaper. This is sooo good! Is there an alternative to stevia ? What can I use instead of stevia ? What is the quantity to use ? I made this and it was really good! Although I would advise doubling the oats, cinnamon, and butter ( the crumble mixture) because the amount in the recipe is actually not that much and I would prefer more. Otherwise it was a really good recipe and really tasty!!! Also you can just use regular sugar instead of the stevia.